Menus are an essential aspect of any restaurant, or food or beverage service business. 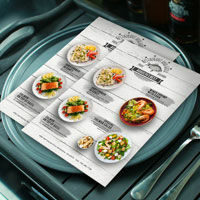 NextDayFlyers offers menu printing for dine-in menus as well as takeout menus, in a variety of sizes and folds. Print in full color and choose a glossy UV coating or a matte finish to complete the look of your menu. We’ve chosen quality paper and cardstock that provide strong durability and excellent color reproduction. Plus, they’ll feel good in your customers’ hands. We know that menus with great photographs can stimulate the appetite, and we’re proud to say that the quality control we bring to each job guarantees your printed menu will come out looking fantastic. It’s not just a bold statement - we back it up. NextDayFlyers offers a 100% quality guarantee on all our print orders. It works like this: either you’re 100% happy with your custom-printed menus, or you get a 100% refund. It’s that simple. What takes place behind the scenes to make sure your order comes out looking great is, however, complex. We use a 33 quality checkpoint system to verify the accuracy of your menu throughout the printing process. Machine and human inspection methods are used during the pre-press, press, cutting, bindery, and shipping stages to ensure no element of your order is overlooked. Before your order is shipped to you, it’s been thoroughly inspected by trained Quality Assurance Specialists. We hope you’ll print with us, knowing that our prices are competitive and that we’re tops in quality among companies that print menus. 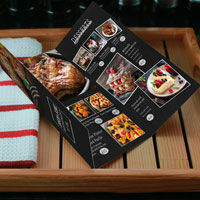 If you own a restaurant, you need to consider how menu printing could help you maximize your profit. For most restaurants, the role menus play in your business is straightforward: it is your face to the customer. While ambiance and service are important, your customer is guaranteed to spend concentrated amounts of time looking at your menu. Make sure you’re making a good impression during that time with a printed menu that shows not just your food and drink offerings, but who you are. If your café or restaurant is unique because you only use organic ingredients, or perhaps it’s a family business with recipes which have been developed over generations, share that with your customers and include it on your menu. Let your customers know why your restaurant is special. If you’re printing take-out menus, consider putting in a promotional coupon. Coupons have been proven effective at bringing in new customers.